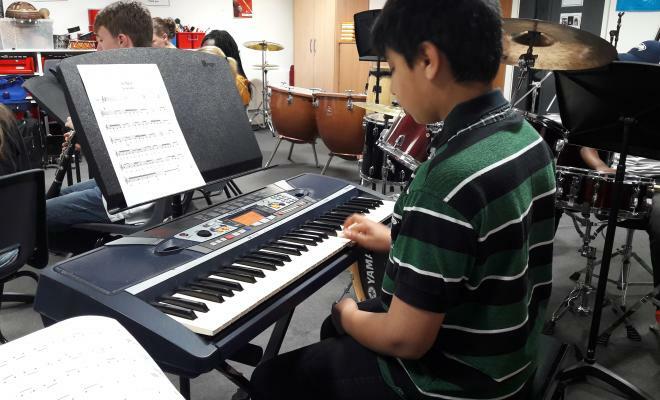 MKIAC for the second consecutive year worked with Shenley Brook End secondary school students and The London Syrian Ensemble to create a new composition to perform on stage at the Art at the Lake Festival. The London Syrian Ensemble is a collective of some of Syria’s finest musicians. They encapsulate the sounds of Syria through a diverse repertoire of classical and traditional music from the region. The musicians either studied or taught at Damascus's prestigious Conservatoire. The classical musician Rihab taught 15 students the sounds of Syria and a new way of reading classical music. This project was a fantastic example of east meets west through education. “Our students and teachers really enjoyed working with Rihab and she clearly felt likewise. They found her music stimulating and challenging and enjoyed the experience even more than last year. The students enjoyed learning a new form of musicality from a different culture and experimenting at how to perform this on instruments from their own culture. This project has been very successful in helping our students to understand an aspect of Syrian culture which is vibrant and of great heritage and so much more positive than the understanding that they gain through what they learn through the media.